An annual fund for programs, services and core operations for charitable organizations in the Central and South Okanagan. Any registered charity that demonstrates need and impact in one or more of the United Way focus areas may apply for the Community Fund. The funded programs ultimately support positive change and impact the lives of thousands of vulnerable people in our communities, providing opportunities for a better life for everyone. Any registered charity that demonstrates impact in one or more of the United Way Strategic Focus Area may apply to the Community Fund. There are two applications available for Community Fund recipients. An organization may only apply to one of these per year. Core Operational Funding: funding towards administrative salaries or wages, site expenses, insurance, or organization promotion expenses. *Note* If you are applying for less than $5,000 please complete the Community Fund Application Short Form. For registered charities in the North Okanagan Columbia Shuswap areas, the Community Fund will be open for new applications in January 2020. 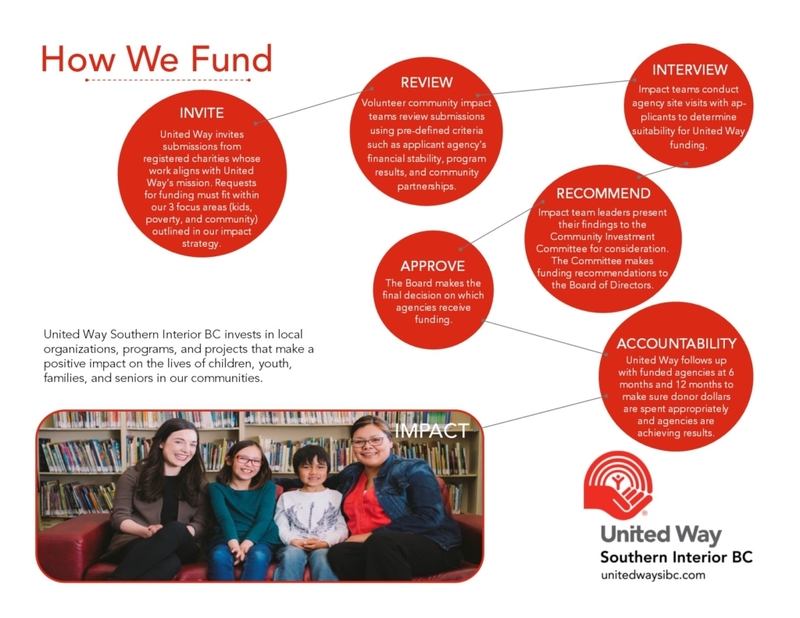 Those agencies funded during 2018/19 will continue to receive United Way funding through to the 2020/21 cycle on receipt of a completed impact report and assessment of ongoing need. The 2019-2020 Community Fund (Central and South Okanagan) grant applications deadline was March 22, 2019. We are now in the process of evaluating those applications and agencies will be contacted in the next few months. Please contact Jude Brunt at jude@unitedwaysibc.com or call: 250-860-2356 for more information. The United Way’s process of allocating funds to local non-profits is collaborative and entirely volunteer-driven. Volunteers review grant applications, make site visits to each local agency, and participate in meetings during which charity representatives present their application and explain what it will do with the funding. The volunteers then form recommendations to our volunteer Board of Directors with the goal of ensuring that United Way invests donor dollars to best meet the needs of our community. Click below for more information on United Way SIBC’s funding process. Show your local love. Take action today!